The onset of frosty weather and gusty winds take a real toll on the skin. Add dry heat and/or roaring fires to the mix and you have the recipe for a skin disaster. Therefore, during the cold weather months it's extra important to adhere to a daily skincare regimen that protects and nourishes the dermis. Cleansing is the essential first step to any skincare routine (at any time of year) and is crucial to ensure removal of makeup along with any pollutants and debris that collected during the day. In the cold weather, you want to opt for a creamier formulation to offset increased dryness in the air. For example, instead of using a foaming gel cleanser (which can be drying to your skin), try a cream cleanser or cleansing oil - which not only removes all traces of makeup, but also deeply cleanses skin while continuing to nourish and hydrate. While important year-round, exfoliating is particularly key in the cold weather months when the air is no longer warm or humid and our skin renewal process slows down. Cold weather skin will look dull and lifeless unless you remove the top layer of dead cells, so be sure to exfoliate once or twice a week (any more can be irritating). You can either use a physical exfoliant (such as a face scrub) or a chemical exfoliant (such as alpha hydroxy acid - AHA or beta hydroxy acid -BHA). Remember: Skincare products won't get absorbed into the skin properly - no matter how expensive they are - unless you exfoliate! 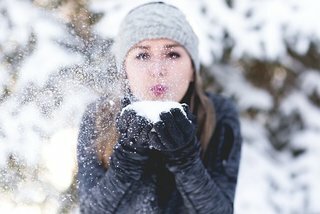 So, avoid wasting product and money by making sure this step is on your cold weather, skincare to-do list. Serums are lightweight moisturizers that penetrate the skin with beneficial ingredients intended to firm, protect and nourish (serums are applied before traditional moisturizers). Antioxidant serums, for example, protect the skin against environmental toxins, while oil serums can help skin to maintain plumpness and fight against dryness. Some contain vitamin C, a skincare powerhouse that helps brighten skin and boost vitality at any age. Vitamin C can also help younger skin battle breakouts and reduce the appearance of fine lines in more mature skin. There are also countless types of face masks to address a host of skincare concerns. Sheet masks (cotton sheets soaked in skin-loving essences) are a go-to for Korean women, while clay masks (that you spread on) are great for detoxifying the pores and absorbing excess oil. There are also anti-aging, hydrating, calming, and skin-brightening masks. This is an essential step throughout the year, but it obviously becomes paramount when the skin is under attack from dry air and frigid temperatures. Skipping this step could lead to cracked, flakey and peeling skin that is both uncomfortable and unreceptive to makeup application. The type of moisturizer you choose should depend on your skin type. For example, if you have oily or combo skin, you might opt for a lighter gel moisturizer. More mature, thirsty skin might prefer a thicker, heavier formulation. And don't forget the eye cream, a vital step in caring for skin at any age. Exfoliating and moisturizing are equally important for the rest of the body. Be sure to use a body scrub at least once or twice a week to help slough off dead skin and smooth away rough/dry patches. Follow every shower or bath with a super hydrating body cream/lotion to prevent itchy, tight, rough and bumpy skin. Don't let the chilly, dry days wreak havoc on your skin. Follow these simple steps to keep your skin moist, healthy and happy! Shawn Burger has been interested in cosmetics and skincare since she was 12 years of age. She is currently working toward a degree in business marketing at Western Connecticut State University and plans to pursue a career in the cosmetics industry.